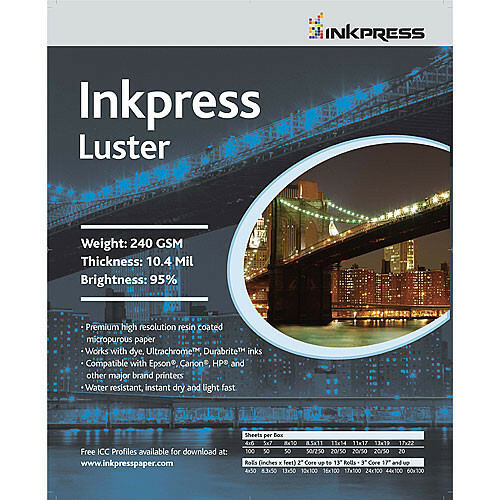 This 50-sheet pack of 13 x 19" Luster Paper from Inkpress Media features resin-coated microporous paper with a luster surface finish. This paper has a basis weight of 240 gsm and a thickness of 10.4 mil as well as a 95% brightness. Additionally, the paper is water and light resistant for durability and instant drying for immediate handling. Box Dimensions (LxWxH) 19.3 x 13.5 x 1.0"
Luster Paper (13 x 19", 50 Sheets) is rated 4.7 out of 5 by 21. Rated 5 out of 5 by Valentinophoto from Great paper for exhibition prints I do wedding and portrait photography and use this paper to print wedding photos for use at bridal fairs. Mounted on foam board, without frames, these photos really stand out and get the most attention at these events. The vibrant colors and smooth surface are great. Left unframed in my bright sunroom/porch for over 9 months, the photos show no signs of fading. This is not recommended, but it is used as my test. You would not believe how quickly some other papers fade. Rated 4 out of 5 by JMinCO from Excellent value! This paper is very heavyweight and produces very nice prints for the price. I've compared to papers that are much more expensive, and I found the more expensive paper to be only slightly better in terms of print quality. In today's market, you have to save those pennies anywhere you can... this paper works great and most customers will never notice the difference. Rated 5 out of 5 by Anonymous from Great Value Found this paper to be well above expectations. Paper surface is very uniform and free of visable defects. Worked excellent with my HP inks and printer. Image when printed is visable even at sharp angles without ghosting. Handeled high ink density areas very well. This paper will replace all of my general use papers and even some of my more expensive papers. Rated 4 out of 5 by Bryan from Best paper for the price I used this paper for most of my schoolwork and some of my professional work. It hasn't failed me yet, and everyone has always been impressed at the colors and tones I can coax from it. It's far better for my color photos than for my black and white. I use it with Epson 3880 inkjet printers and I've never had an issue other than user errors. Rated 5 out of 5 by GLP from Love it I was using Epson Premium Luster Photo Paper for a few years now. I decided to give inkpress a try. The quality of print is no different than I was getting from epson. I love the price difference. I would buy inkpress products and recommend it to everyone. I use same color profiles that I'd use for epson and it works. Rated 4 out of 5 by Kurt K. from Very Good Paper I've used this paper for a couple of years with an Epson 1400. Seems to have a wide dynamic range, accepts the dye-based inks from this printer nicely, renders color well. The finish is nice, not great-great, but pleasing. I recommend it and hope Inkpress keeps making it. Rated 5 out of 5 by Tara the Photographer from Love it! I use this produce mostly for work prints, but those work prints look great! I love them! Its a cool toned paper, but still stays fairly neutral and I appreciate that. I also love the luster. This paper was also so much cheaper than the epson with the same quality! Rated 4 out of 5 by Justin R. from Good Stuff Good affordable paper if you are selling prints to people, or even keeping for yourself. Its not very thick and a little flexible than what I usually use (Ilford Gold Fibre Silk), but it is a good paper for the money. I would recommend it over Epson Luster..